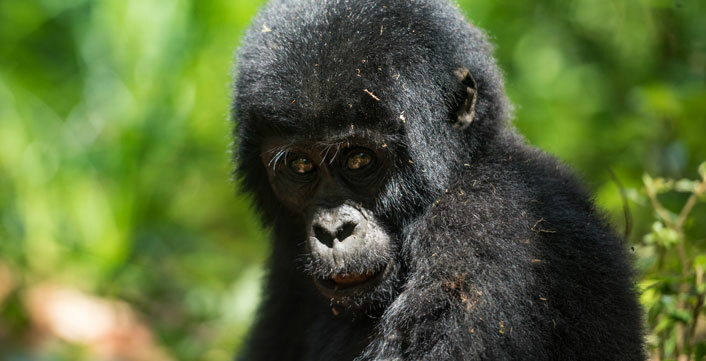 Our 2 days Gorilla trekking Rwanda will lead you to the Land of a thousand hills which is popular for arguably one of the best and most remarkable wildlife adventures in the world with incredibly beautiful scenery that it offers to all its visitors. Tracking the Mountain Gorillas in Volcanoes National Park is quite the perfect adventure that will be a memory to forever cherish. You will be picked up from your hotel by your guide / driver to begin your journey to Volcanoes National Park. Upon your arrival, you will check into your booked safari lodge, have your lunch and later set out for an evening guided nature walk that will allow you get up close with nature and bask in the beautiful scenery. Return to lodge for dinner and overnight. After your breakfast, you will transfer to the park headquarters at Kinigi for briefing about the Gorilla tracking activity and acquainting yourself with the family you will be tracking. After briefing, you are most definitely ready to set out to begin your adventure. When you finally find these gentle giants, you will be allowed a maximum of one hour to view them, take plenty of pictures and take the trail back to the starting point of the track. After getting your Gorilla tracking certificate, you will return to your lodge for lunch, check out after lunch to begin your drive back to Kigali. Depending on your flight schedule, you can get some time to briefly tour Kigali City and also stop at the craft market for some souvenirs to take with you back home or fully explore this beautiful city if your flight is scheduled for the next day.